1920s and 1930s Era Jazz Piano Player, Magician, and Stage Hypnotist. If you need entertainment piano-bar style, Vaudeville, or Burlesque, this is it. Think back to the Jazz Age, gangsters, card sharps, and speakeasies. 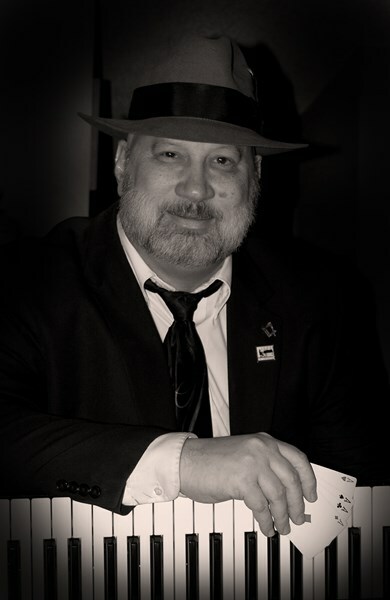 Brett takes you back to that time, playing traditional New Orleans style hot jazz and performing even hotter magic up-close and personal for your guests. And get ready for a laugh a second when Brett takes the stage for a one-of-a-kind Hypnosis Show, Vaudeville style. Over a period of usually 1-3 hours, Brett plays early jazz music on the piano of the 1920s and 30s, periodically stopping to engage guests with incredible "How'd you do that?" close up magic. It's an immersion of sight and sound into the Jazz Age. Entertainment is usually provided during cocktail hours and guest mingling. "Grab your favorite toots and get your wiggle on. Abyssinia!" Please note Brett Cantrell will also travel to Jennings, Lee, Jasper, Pinetta, Lake Park, Madison, Barwick, Live Oak, Statenville, Day, Mc Alpin, White Springs, Naylor, Greenville, Wellborn, Quitman, Shady Grove, Morven, Hahira, O Brien, Cecil, Dixie, Mayo, Perry, Lakeland, Lake City, Fargo, Stockton, Du Pont, Berlin.